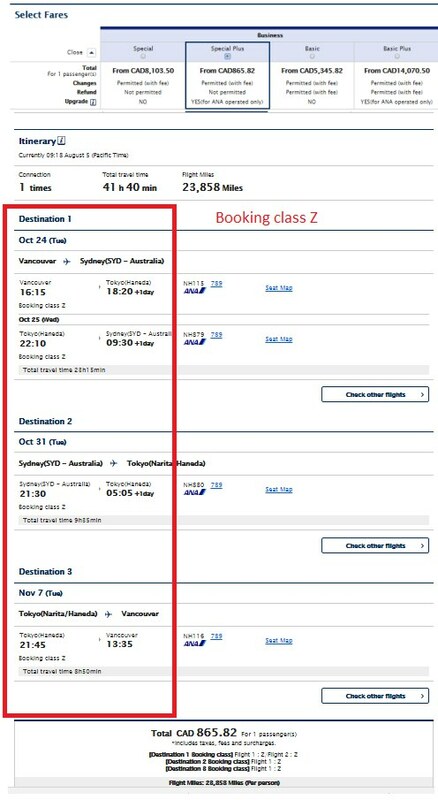 All Nippon Airways (one of the world's top airlines, ranked #3 this year) is showing an incredible price on a 2-in-1 trip from Vancouver in *BUSINESS CLASS* that allows you to visit and spend time in both Sydney, Australia and Tokyo, Japan for $865 CAD including taxes. The flights have 1 stop in Tokyo on the way to Sydney, and are non-stop from Sydney to Tokyo, and also non-stop from Tokyo back home to Vancouver. 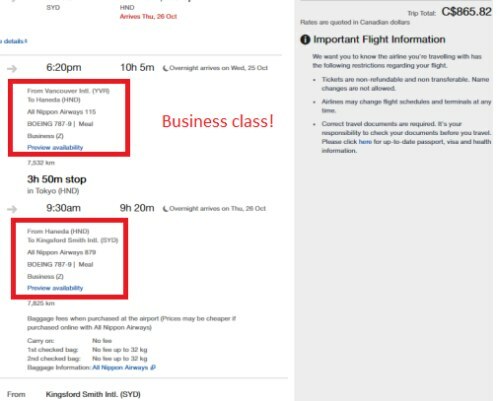 NOTE: These are booking class Z tickets (heavily discounted Business Class). But you still earn 125% of the miles. On these flights that's nearly 30,000 miles! ANA Mileage Chart. These are tickets that are *supposed *to cost more like $5500 to $6,000 ! Note: The Multi-City feature is not available on Momondo's mobile site. Dec 4 to Dec 11 to Jan 2 -- over Christmas and New Year's! Dec 7 to Dec 14 to Dec 28 -- over Christmas! Dec 7 to Dec 14 to Jan 4 -- over Christmas and New Year's! (December 7 appears to be the latest in the year you can depart. You can return pretty much any time in the first half of 2018, as far away as June 7th, 2018). NOTE: Many more date combinations than what are listed above appear to work (although only within these months). You can try playing around with different dates to give yourself more or less time in Japan or Australia. I'll keep adding more dates to this post as I find them. These will be disappearing like lightning. Don't give up just because one set of dates has sold out. Keep trying different dates, even slightly different dates from what I've posted can make a difference (those dates are likely to sell out first). Try focusing on Monday/Tuesday/Wednesday/Thursday dates. I'm adding some more working dates now that I have a minute. Feel free to comment below and post dates you've tried that are working to help out your fellow traveler. 4. Click through from Momonodo to the booking site showing the cheap price. Expedia is one of the booking sites showing these, and would be my pick. If these turn out to be a mistake, historically, Expedia has been one of the better sites for honoring mistake fares (no guarantees though). Priceline is also showing these, and they have also been pretty good at getting tickets issued quickly enough during crazy demand periods of mistake fare madness. Priceline also offers completely free cancellation within 24 hours, which gives you time to decide. Update: These are also showing up directly on the ANA website (see update below). NOTE: Once your search completes, you should see some options at the top. Change it from Special to Special Plus. Extra special indeed! IMPORTANT: Keep your expectations low until it's clear that these tickets have been issued and will be honored. I know it's very exciting, but I just don't want to see anyone's dreams crushed! It's usually clear within 12-24 hours whether or not the tickets have been issued and will be honored. Update @ 1:10 PM PST / 2:10 PM MST / 3:10 PM EST - I think this is over now. I haven't seen any dates in the last 20 minutes that are still working. I will update the post as soon as I hear from people about the status of their ticket. Generally in these situations, if all goes well, you should receive a booking confirmation code (6 characters) or ticket # (13 digits) that you can use to check your reservation directly on the ANA website. If that happens, it's a good sign, because it means ANA has issued the tickets and your reservation is solid. Update 8/8 - It's been 3 days, and with the weekend well over, giving ANA more than enough time to deal with this, it's now safe to say that it appears ANA is going to be honoring what was the largest mistake fare they've ever had, and one of the largest mistake fares of the year from any airline. 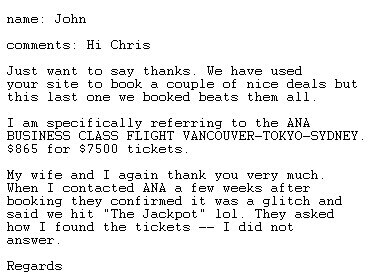 - Quite a few people have heard from ANA customer service reps confirming that ANA is going to be honoring all tickets that were actually issued. - The only cancellations I've heard of were from bookings made through booking sites that were not fast enough at actually getting the tickets issued (such as ClickMyTrip). - You can check your booking directly on the ANA website, using your e-ticket number. - A huge thank you to ANA for honoring this. - Congratulations to everyone that was able to book this, and enjoy your multi-continental trip in business class! TOKYO (HND) - At Tokyo's Haneda airport look for the ANA Lounge. You do not get access to the ANA Suite Lounge (that's for first class). But the ANA Lounge for business class is also very nice! You can read the reviews on Yelp. SYDNEY (SYD) - At Sydney airport look for the Air New Zealand International Lounge. You get free access to Air New Zealand's lounge because you are flying on a Star Alliance partner (ANA). vancouver, yvr, flight deals, asia, east asia, tokyo, japan, hnd, nrt, ana, australasia, australia, sydney, syd, all nippon airways and oceania. 68 Responses to "2-in-1 trip: Vancouver to Sydney, Australia and Tokyo, Japan - $865 CAD roundtrip including taxes on ANA in Business Class!" LOL great deal. At least they should compensate customers when they realize it's a price error or maybe they honour it? WOW, and business class too!!!!! Business Class Z all the way! Booked! That's crazy deal, Thanks! Status: Still alive as of 11:46 AM PST. Saw Oct 31 to Nov 7 to Nov 14 verify on the ANA website (although these dates now only show 1 ticket remaining). Thanks Jess! I think the deal is over. All of the results are now over >5000. But oddly enough, in the airline filters sidebar on Momondo, it's still showing the low price for Nippon. But the results don't display it. If you pick the filter, you can see the low priced results grayed out behind the warning that "no matches were found". I guess it's showing cached results and the actual results are gone? I was lucky to get two tickets ! Seems like all the date combinations have all gone up too $5000k per ticket ???? This does not seem to be working anymore!?? Could be over or nearly there. Having trouble finding dates for $865. Seeing some dates on the ANA website for $915 such as Oct 16-23-30 and Aug 29-Sep 5-Sep 12 but with 1 seat left. Be sure to share if you spot any more! Just spoke to FairGeek... These tickets should be confirmed if their Business Class or not within in 2-3 hours depending on who you booked with, and if your from Canada... You have till midnight tonight to cancel with a full refund. Personally regardless business class or not still a great deal ! Update @ 11:21 AM PST - She's not quite a goner yet. Just saw Oct 16-23-30 for $865 on the ANA website, but 1 seat remaining. So there could still be more out there. availability is fading., it seems the bottleneck is outbound flights from YVR. Just found Dec7-14-21 for $915. Still worth it! Thanks for the info Jess! Lay over in San Fran on the way there and a short switch in Seattle on the way home. Had the most trouble finding Tokyo to Sydney in business but tried a couple dates and landed one ! I'm seeing some normal roundtrip fares from Vancouver to just Sydney, Australia (SYD) in the $800s (business class) on the ANA website. Combinations of dates from different lines in the list above may also work. Still looking - seems like I have tried every combination. Anybody have any luck on dates in Nov/Dec? Update @ 12:57 PM PST - Okay, now all the regular roundtrip fares to Sydney seem to be gone (back to normal price). This could really be over now. Found several but they all seemed to disappear! Would like to know if those that booked actually work out? Will keep everyone posted once it's confirmed ! Thanks Jess, I'll update the post as soon as I hear from anyone who booked this. Anyone book any recently? Trying to use a combination of dates, but doesn't seem to be working anymore. Just booked via ana website directly. One more question, if ticket is canceled is it possible to get cancellation insurance though credit card company? Thanks for the great deal!! I booked directly on the ana webpage and have a recieved a Delivery of e-Ticket and confirmation number . does this mean its official?? Hi H, I would still hold off for a day or so yet, just to make sure. If an airline is going to retract on a mistake fare it's always within 24 hours or so. Thanks for the update on receiving the e-ticket and confirmation number, that is always a very good sign! I don't want to get anyone's hopes too high, but I have yet to see an airfare deal with ANA where the e-ticket was issued that did not work out. This is obviously a pretty unusual case though, since it's business class and not economy, and the tickets were about $5000 less than normal! Thanks for posting this. please keep us updated if there are new dates that would work! Can't find a single combination. Just spoke to ANA directly... It was a system glitch apperantly they will be honoring it ! Just keep an eye out for your inbox for confirmations ! Wow, that's great to hear Jess, thanks! Darn! Missed it! For those who got it - enjoy! Superb deal! I would have to give it up too you for finding the glitch Chris ! I think the deal might be over. I am seeing Special Plus fares of $15,291.64 on the ANA website for all the date combinations I tried (all ones on the list). Booked through Expedia, got my confirmation, I logged on to the ANA website and even have my seats assigned. It ended up costing $1100, econo on the way there and business class back. What are the chances this will get cancelled? Based on the past history of airfare glitches (most amazing deals aren't truly glitches these days, they're pretty rare now) , once the tickets are issued by the airline, there's a pretty low chance the tickets would be cancelled. If they are going to be cancelled, it will be within 24 hours. It's also a very good sign that someone at ANA told Jess they will be honoring it. Booked the deal a few hours ago - $915.66 all in . Vancouver - Tokyo - Sydney -Vancouver (via San Fran ) . Tokyo to Sidney is Economy . Everything else is Business except San Fran to Vancouver ( First !) . Thanks Chris !! This is my Second trip to Japan courtesy of your deal alerts . Much appreciated ! Anyone book recently? Can't seem to find any these prices during Nov.
Called ANA after seeing an error message in issuing the e ticket as well as a delay compared to the other posters here. I have a reservation but no ticket (Oct 16-23-30/31). They are not going to honour the price from the sounds of it since the e ticket was not immediately emailed out and they will just cancel the pending credit card charge. ???? I might argue with a different supervisor tomorrow. At hour 3 when I booked, ANA had already shut down the e ticketing system. I just have a meaningless reservation code with no confirmation email and there's nothing for them to cancel (learned that the hard way today). By the time I phoned at hour 10, they were well rehearsed with talking points and were never going to issue the tickets unless I paid the current fare. Chris was right to temper our expectations. Congratulations to those with confirmed flights! II booked YVR-SYD-HND-YVR by searching via Momondo.ca and booking through Faregeek after I had googled reviews of OTAs. It was before I had seen any mention of being able to book this on ANA or United, Expedia wasn't available and the Flight Network ones I saw disappeared. I had everything booked by about 12:35pm EST and got a confirmation email. Then checked my cc about an hour later and saw a charge from ANA. Got a 'ticketed email' with an ANA 6 digit confirmation number around 6:30pm EST. I then went on ANA and saw reservations details and an e-ticket PDF. I was then able to pick my seats at that time. Thanks, Chris! Hi Stephanie, yes, unfortunately it's definitely long gone now. It lasted until sometime in the afternoon yesterday. THANK YOU Chris Myden for posting this INCREDIBLE deal!!! Immediately checked out Momonodo for various dates in Oct/Nov for 2 pax, 2 weeks. Dates were available, followed the link to Expedia to book, but when I went to Confirm, Expedia kept saying Try Again (overloaded with others trying to book???) After multiple attempts of trying to confirm, I realized Expedia wasn't going to confirm it. After trying multiple other options, and about an hour later, I tried to book thru ANA. 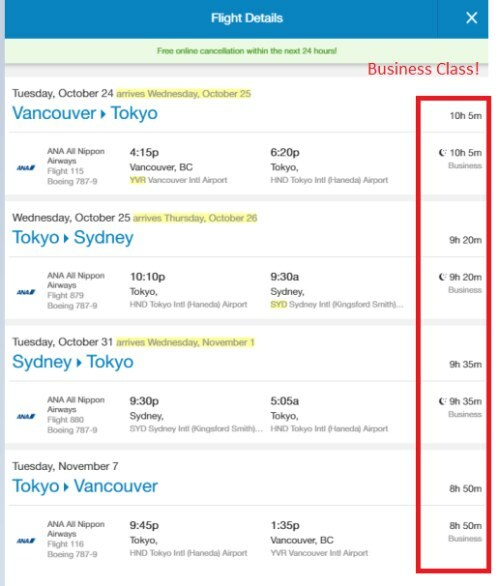 Sadly, the cheap price for my dates was not available and my dreams of flying BIZ class from YVR to Sydney & Tokyo were gone...or were they??!! I walked away but then about an hour later (so 2 hours after seeing the initial post & trying to book thru Expedia), I tried Google Flights. 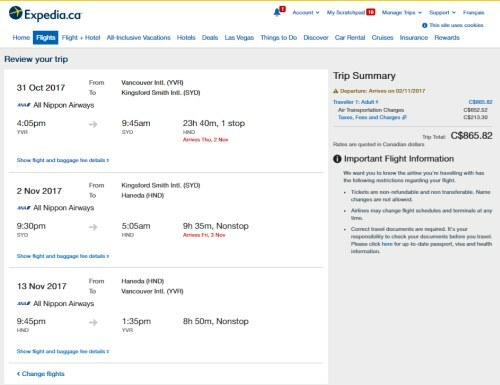 Same dates & flights were showing at $17,500CAD, compared to the original quote of $1732CAD (2 pax) earlier on Expedia. I altered a day here & there and to my shock, by dropping 1 day in Tokyo, Google Flights showed flights for $1832CAD! I followed the Google Flights link to book, which took me to United. Thought it was a bit weird to book everything thru United but hey, United's legit and it allowed me to book. All flights, all seats and all BIZ (Z class) for $1832CAD!! Confirmation via United came through & included the 6 digit code as well as seat assignments (all BIZ class). Fly YVR-SEA(Air Cda,1.5 hr layover)-TOK-SYD-TOK-YVR (all ANA). We are thrilled! Point of this long post, never give up searching, alter a day here or there and don't forget about checking Google Flights. Happy travels to all...and thanks again Chris! Forgot to include, everything was booked Aug 5. Any chance this once in my lifetime deal can happen again? Missed out! Huhuhu. I think I was one of the lucky ones. Booked within hours of your post on ANA website for $786CAD, class Z, routing YVR-LAX-TYO-SYD, SYD-TYO-YVR. Fare was $550 with $235.79 in taxes.... until I get on plane I wont believe it. We were successful booking around 9:30 AM on the 5th with TD for Expedia and received the e-tickets within a few minutes. We immediately went to the ANA site and used our confirmation number to get in and pick our seats and meals. How do I confirm we are solid with these tickets so I can start booking everything else for the trip? Any suggestions? Wishing I was one of the lucky people who got tickets! The Greatest deal of all time and I missed it! Hope we get more deals from YVR. Perhaps you should have a star rating if it is is super Greatest deal ever as warning to "book first and think later". I just received a very unexpected phone call from Torrance, CA. At first, thought the agent was going to apologize and nullify the reservation but no....it was to confirm the purchase! $915 YVR-HND-SYD-HND--NRT-SFO-YVR. This is incredibly admirable of ANA. Thank you once again Chris, I was going through a difficult personal situation and am so happy to have lucked out here. Glad to hear it! Can you tell us which site you booked on? Was it through the ANA website directly? This afternoon, I've been hearing from people who thought they were out of luck in regards to this deal, because their ticket status has been showing as 'Purchased/Not Ticketed', and they never did receive an actual e-ticket. However, ANA has apparently been calling people in this situation, and asking for their permission to authorize the ticket purchase, at the mistake price, and they are then receiving the e-ticket about 10 minutes later. Just to clarify, I don't think this applies to those who purchased through a booking site that was not quick enough to get a ticket issued. I think it might just be special situations where a person was almost ticketed, but not quite (maybe not enough inventory on one of the legs?). I'm not entirely sure who it all applies to, but one thing for sure, ANA is pretty incredible for doing this. Not only are they honoring the mistake for everyone that was ticketed, but they seem to actually be *trying* to honor more bookings that they could easily claim were never ticketed. I think ANA should really milk this to show how awesome they are to honor the mistake fare. I was lucky enough to book through ANA so ANA provided me with a ticket. Yay! I still need to take another trip in December to Japan which I still need to book and will book ANA no matter what. They are still one of those airlines that have genuine focus to ensure customer satisfaction. I hope everyone enjoys this privilege and I am sure I will see some of you on board with smiles a beaming. Thanks Chris for this, past, and future deals to come. Thanks for posting another amazing deal, Chris! My bf and I will be spending a week in Australia followed by another week in Japan in December. Three of the four flights are in business class. Maybe we'll somehow convince the gate agent to upgrade our seats from economy on the SYD-HND leg. Wishful thinking...I know. Our CC was finally charged last night, we've received confirmation email from ANA, and we've chosen seats for all four legs. Looks like we're good to go! I booked on Aug 5th on the ANA website for $915 and it looks to be all confirmed. YVR-SEA-NRT-HND-SYD on the way there and SYD-HND-YVR on the way back. Booked for Dec 6th to Jan 2nd! Thanks Chris! Definitely the best deal I have ever had the chance to capitalize on!